Got some very promising reports today, the eave of Earl. Bluefish continue to be taken deep. Today I heard that butterfly jigs were working just outside the mouth, near the MR buoy. Still no blues on the shore so far. 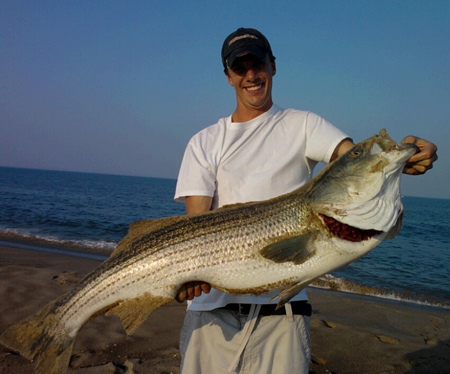 But against all odds, we have a picture from our pal TallJeff with his personal best 46″ 34.5 lb striper. Judging from the photo he was on the beach, and he says it was on a slab of mackerel. Nice fish. I was looking forward to the first weekend of drive-on fishing, but looks like I’ll have to wait. Hopefully Earl will deposit some sand back on the other 5.5 miles of beach, rather than take away from the 1 mile that we do have!